It’s time to clean Smarter!!! Technology is advancing quickly and in order to clean up our waterways, devices that capture debris 24/7 are the way to go. It beats manual labor that can be quite arduous and often dangerous. Quite simply put, ‘Two men in a tinny with a set of tongs’ is not going to clean our waterways sufficiently. We are constantly developing solutions and every problem will have a different solution. So talk to us about what is best for your waterway. Our new river cleaner is designed for major rivers where debris travels in current. It is a conveyor belt driven by solar power that lifts the debris into a skip bin ready for removal. The ease at which to service this device is the best part. With traditional booms you have to lift the debris out of the water with nets, scoops or claws, often spreading micro plastics into the waterway. 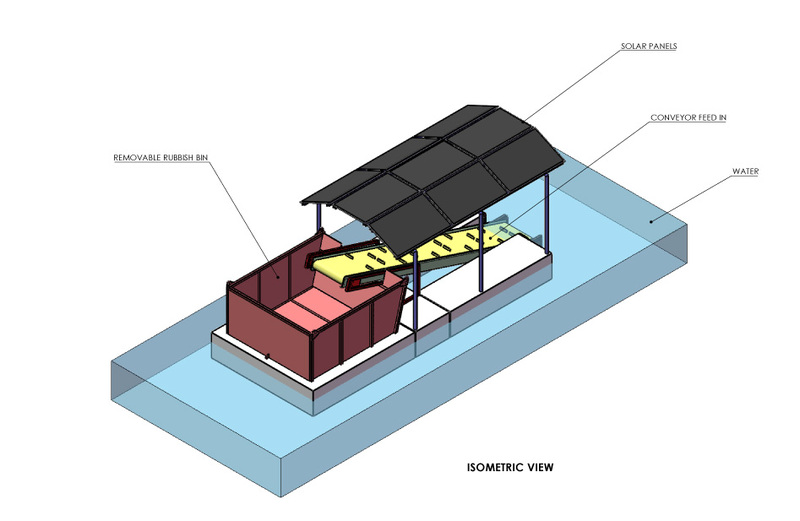 This system will involve simply floating the full skip bin out and floating an empty one in. You then take it to shore where it can be lifted onto a truck and taken for processing. 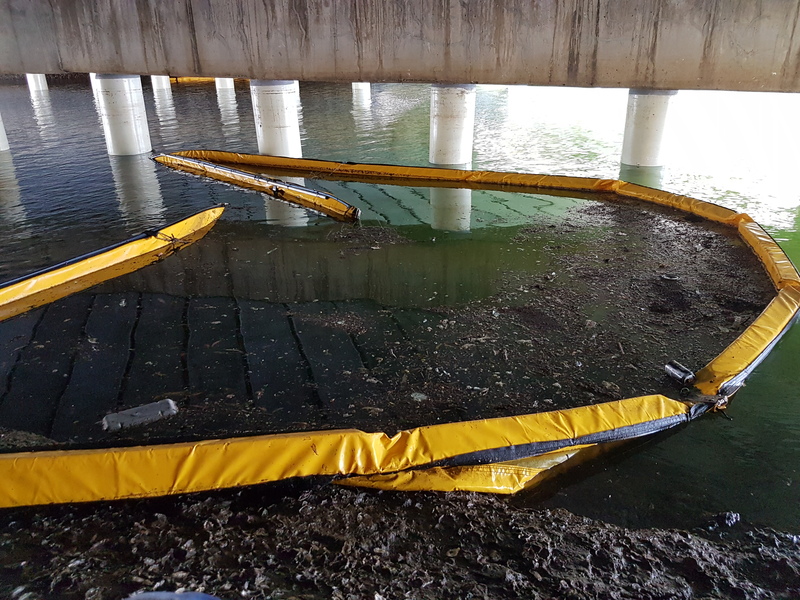 With debris removed from the water there is no risk to wildlife, no risk of it escaping and it has the ability to dry out and hence less weight. If it does break apart in the skip bin, it is still encapsulated. The addition of floating booms will enable capture from a larger area and the solar system will be backed up by an automatic generator system so when the batteries get low, the generator kicks in. We are also working on switching systems so they only work when the tide is flowing in the right direction, automatic ‘Full’ switches to notify you when the skip is nearing full, automatic fault notification to enable prompt repairs and an automated daily email with images of the skip bins so you can organise servicing only when required. The prototype of this device will be built in 2019 when funding becomes available. With the sides of the solar structure suitable for art work or logos, there is the ability to have a major sponsor for each device with council/government providing funding for servicing. The STAR Marine Debris Collector has been developed in Western Australia with several devices installed through the region. This is a non powered device that secures the debris from every angle and encapsulates it in the middle ready for removal. The dimension of the internal collection area is 2.5m wide with the arms stretching out a further 2m ensuring a large catchment area. The gates on the device are flexible and hence raise and lower pending the direction of tide or wind. The system is easy to install with a single clump weight holding it and it can be lit at night with solar lights. The sign feature enables for promotion of the device to educate the community on what is being collected or to promote a sponsor. Cleaning out the system is by scoop which can be done from any small vessel. With no bottom to the system, the majority of biomass will eventually sink once saturated, leaving lighter plastic objects in the system ready for collection. The booms have been specially designed for debris and feature a 150x150mm float in either blue or yellow with custom labeling on webbing available. An additional sleeve allows you to shape the boom with piping. The net drops just 30cm with a 10mm chain along the foot to hold it down. The importance of the shallow foot cannot be underestimated as it allows freedom for all wildlife. 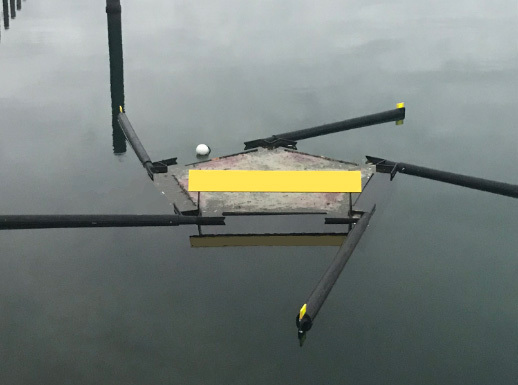 Examples of both booms were developed with the support of the Sunshine Coast Council and in a recent test, a GPS Tracker installed upstream was located in the boom, preventing it from escaping into the Maroochy River and eventually the ocean.